The Democratic Party has waged a war against straightforward speech for decades. They aren’t pro-abortion. They’re pro-choice. They aren’t anti-gun. They’re for gun control. They aren’t pro-terrorist. They’re just opposed to racial and religious profiling. They aren’t big spenders. They’re pro-government ‘investment’. They aren’t the party of tax increases. They’re the party that favors the one-percent paying their fair share. They aren’t anti-fossil fuel. They’re pro-green energy. They aren’t pro-oppressive regulation. They’re for ‘common-sense regulations’. Pardon my French but that’s BS. Democrats are pro-euphemism because that’s the only way their ideas sound palatable. If they didn’t spin what they’re for, they’d never win another election throughout eternity. At minimum, they’d get their butts kicked each year if they couldn’t hide their real identity. The truth is that today’s Democratic Party is a collection of lunatics that don’t care about national security or our Constitution. 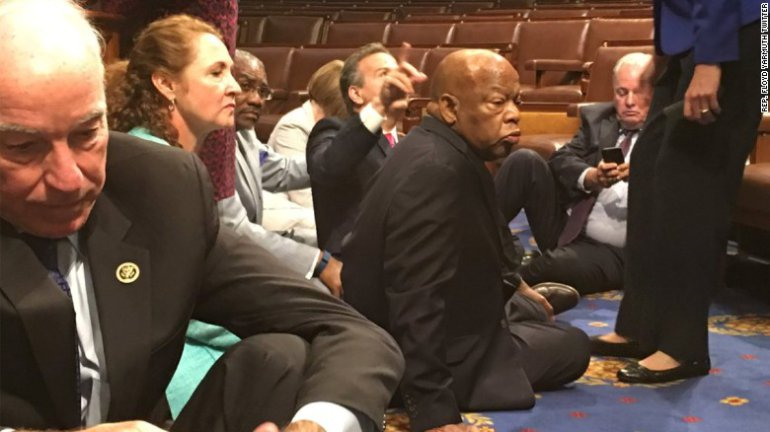 The proof of that is the legislation that they pushed and the faux sit-in they staged. I wrote this article to highlight Hawaii’s disgust with the Constitution. Their governor just signed a bill that requires Hawaiians who buy a gun in Hawaii to register that gun, which then requires law enforcement to put all gun owners on the FBI’s criminal watch list. The bill blatantly thumbs its nose at the constitutional principles of due process and the presumption of innocence until proven guilty. The Democrats’ fundraising rally on the House floor shows that Democrats aren’t serious about protecting our nation from terrorists. Democrats put a higher priority on playing word games to achieve their goal of controlling people. The Democratic Party of Hubert Humphrey, Pat Moynihan and JFK had a healthy libertarian streak to it. The Democratic Party of Hillary Clinton, Barack Obama, Harry Reid and Nancy Pelosi is defined by its fascist and authoritarian tendencies. Today’s Democratic Party isn’t anything like the Democratic Party of 25 years ago, much less like the Democratic Party of JFK. It’s a shame. We could use that party again. Go back to FDR; that was the good one. The time is ripe for a new New Deal. Bernie and poll results prove that. No thanks. The first New Deal prolonged the Great Depression. More government intrusion, which is certain if Bernie’s making the blueprint, isn’t the solution. It’s the problem. Yesterday’s story that over two dozen Democrat Congressional Pajama Party members are gun owners means we can give them at least two more euphemisms: pro-hypocrisy and anti-truth.